My Sister, who is always making something delicious, sent me a recipe the other day for Pumpkin-Apple Butter. We eat a lot of pumpkin butter at our house so making our own seemed like a good challenge. We started by buying two pie pumpkins at the store. Pie pumpkins are smaller then the normal jack O'lantern pumpkins and a little sweeter, they can be found in most grocery stores at this time of year. 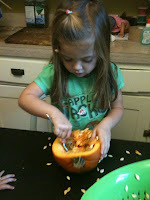 I cut the pumpkins open with a large serrated knife and let the girls scrape all the guts out. 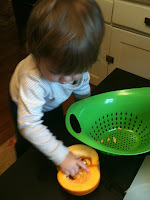 They had a great time checking out the pumpkin insides and scooping the seeds into our colander. After the pumpkins had been fully scooped out, I helped to get the inside fully cleaned out, I then placed the pumpkins face side down in a Pyrex pan, covered them with tinfoil and baked them in the oven for 45minutes to an hour at 350 degrees. After rinsing the seeds I spread them on a baking sheet, seasoned with salt and pepper and placed them into the oven with the pumpkins. The seeds only took about 10 minutes to cook and after a few minutes of cooling we gave them a taste. The girls had never really had pumpkin seeds and both really liked them! While we were seed sampling I pulled the cooked pumpkins out and let them cool for a few minutes before scraping the pumpkin out of the skin and into a bowl. 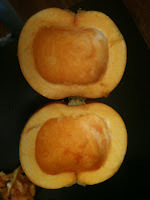 At this point the pumpkin was so soft it was like a puree and the skin was so soft it was literally falling apart. I followed the recipe my sister sent, mixing the pumpkin with one grated apple, 1 cup of apple juice and 1/2 cup brown sugar. The recipe called for pumpkin pie spice, but we didn't have that so I just used some allspice and cinnamon, figuring that was close enough. The end result was delicious and made enough pumpkin-apple butter to fill 4 small jars, one of which is for my sister, as a thank you for inspiring our pumpkin fun! 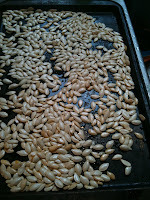 i have never cooked our pumpkins or seeds - been meaning to try it! 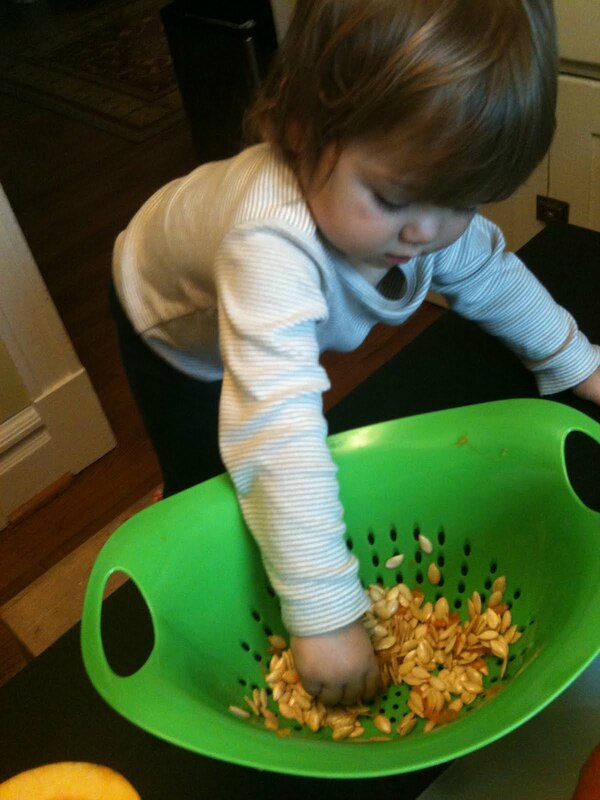 JDaniel loved pumpkin seeds this year. Last year he didn't enjoy them. Thank you for linking to Halloween Traditions!